he Mayan Riviera on Mexico’s Yucatan Peninsula may look like your typical beachside holiday destination, but for spelunkers, cave divers and anyone with a spirit of adventure, its beauty is more than skin deep. Behind the beachfront resorts, the tropical jungle is home to the longest underground river on earth — all 153 kilometres of it. 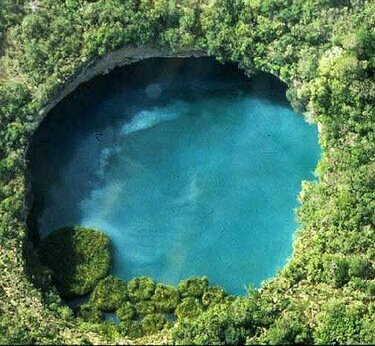 In spots, the earth has collapsed into the waters below, forming cenotes, deep wells of gin-clear water that provide an entry into the surreal underworld. Which river will suit you? For claustrophobics, Xel-Há is the best place to experience the action without feeling locked in. Entry into the river is as easy as lying back in an inner tube and following the current downstream under the reassuring heat of the sun above. The more intrepid adventurer with specialist cave diving certification might prefer The Pit. To enter, divers brave a six meter jump into to the cenote before donning scuba gear and vanishing into the darkness. Most visitors to the Yucatan Peninsular favour something in between. For an underground experience high on thrills but (relatively) low on terror, these adventure experiences stand out: Hidden Worlds, Rio Secreto, Alltournative and Dos Ojos (home of The Pit and a range of other less terrifying dives). Rio Secreto’s underground river, meanwhile, is shallower and largely navigated on foot through waist-deep water. Visitors gear up with wetsuits, neoprene boots, helmets and headlamps for the two-hour guided tour. One of the best aspects of the cenote adventure parks in this area is their rugged authenticity — there are no brightly-lit boardwalk tours with cheesy commentary to be found. Instead, knowledgeable guides lead visitors through caves dripping with stalagmites and swim through deep pools to experience a taste of true spelunking. The cave system is covered in chandeliers of stalactites and rarer helictite formations which encrust the icicle-like structures in a thick coat of what looks like snow. While there is some swimming involved, Rio Secreto’s focus is most definitely overhead. For an entirely different perspective, slip on a mask and snorkel. In the cave system explored by adventure outfitter Alltournative, guests swim in Yax Mul and Nohoch, the very cave explored in the BBC documentary series Planet Earth. Back at the surface the thick jungle gives no hint as to what lies beneath. It is remarkable that one of Mexico’s most incredible sights is hidden from view. It is a wonderland well worth donning a wetsuit for.